Welcome to the CPD toolbox. The toolbox contains information and resources to help you create and maintain your CPD Plan and Record (CPDPR). From 1 April 2014 (with a transition period from 1 October 2013), all New Zealand Lawyers will be required to complete at least 10 hours of Continuing Professional Development (CPD) each year. See Lawyers and Conveyancers Act (Lawyers: Ongoing Legal Education – Continuing Professional Development) Rules 2013. 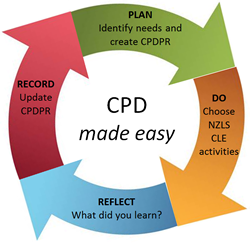 NZLS CLE Ltd offers a comprehensive range of CPD compliant programmes and resources that will help you meet your CPD requirements. We will guide you through meeting your CPD requirements by working through the steps below. The more time you invest in planning your CPD, the more likely it is that you will focus your learning effectively. You will then spend your precious time learning about topics that are relevant for your job and the needs of your practice. Where can I find out more about the CPD scheme? The New Zealand Law Society website provides comprehensive information on the scheme, and resources to assist you in completing your CPD requirements. Additionally, an archvied webinar presentation is available to view - access the archive. If you have any questions about the CPD scheme itself, and what it means for you, you should contact the NZLS at: CPDinquiries@lawsociety.org.nz or phone 0800 223 030.